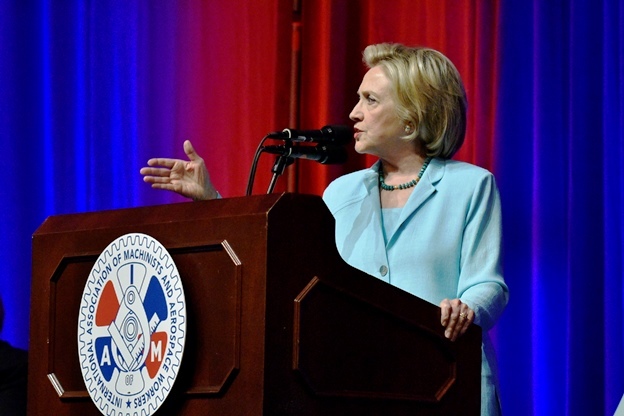 IAM endorsed presidential primary candidate Hillary Clinton is supporting the WAGE Act to better protect American workers who want to seek union representation (Photo: Bill Burke, Page One). Hillary Clinton reinforced her place as the IAM’s candidate for president with an endorsement of proposed legislation to strengthen protections for employees trying to unionize. The Workplace Action for a Growing Economy (WAGE) Act, sponsored by Sen. Patty Murray (D-WA) and Rep. Bobby Scott (D-VA), will amend the National Labor Relations Act (NRLA) by tripling the amount of back pay awarded for employees fired for union activity. It would also give them the right to seek damages in federal court similar to those who have been discriminated against for race or gender. With the deficiencies in current laws, many employers violate workers’ rights with a sense of impunity. The penalties that are supposed to protect workers do little to deter employers from breaking the law. The WAGE Act, which is widely supported by the AFL-CIO and other labor organizations, would strengthen protections for workers who want to organize by establishing severe penalties that will deter employers from violating the NLRA and interfering with workers’ rights. In addition to the IAM, Clinton has secured endorsements from the American Federation of Teachers, the Roofers and Waterproofers Union, the Bricklayers Union and the Plumbers and Pipefitters Union.